Equipment manufacturers have addressed the growing size of workers by offering safety gear that can handle heavier loads. Some studies point to a link between overweight workers and workplace injuries. Being obese or overweight can lead to an array of health problems, which can cost an employer down the line. Glancing through a safety equipment catalog, safety professionals may notice a trend: More products are being offered in extra-large sizes, and more safety gear is being rated at a higher weight threshold. According to the Centers for Disease Control and Prevention, every state except Colorado had a population that was at least 20 percent obese in 2007. As a nation, 66 percent of all adults at least 20 years old are considered overweight or obese. “The normal-weight worker is fast becoming the minority,” said Mark Benden, an assistant professor at the Texas A&M Health Science Center’s School of Rural Public Health in College Station. With larger people come larger challenges in the workplace, particularly to worker safety and PPE. Large workers may have difficulty fitting comfortably into a variety of equipment, including gloves, respirators, eye protection and safety clothing, Benden said. If a worker cannot comfortably fit into the apparel or equipment, that PPE may not work properly – or even worse, the employee may forgo wearing it altogether. Either scenario is a huge safety concern, experts say. Some manufacturers have picked up on this issue and are striving to address it. “It has been a growing trend in our industry,” said Nate Bohmbach, the North American product manager for soft goods at Capital Safety, a fall protection manufacturer based in Red Wing, MN. Although many standards require a capacity up to 310 pounds for personal fall arrest systems, some equipment manufacturers now offer products certified to 400 pounds or greater. At Capital Safety, full-body harnesses are now available in sizes up to triple extra large, which would fit an individual who stands 6’8” and weighs 420 pounds. “What we found is that we’ve received over the years more and more requests from workers needing a higher capacity,” said Marc Harkins, product line manager for customer products at Pittsburgh-based MSA. Harkins noted that many products are custom-designed for workers and stressed that new, higher-capacity PPE takes into account not only a worker’s weight, but also the weight of his or her tools. Exceeding the weight limit of fall arrest equipment can be extremely dangerous – even deadly. When a person falls, he or she generates pounds of force that are exerted on the body. Bohmbach explained that, in demonstrations, test weights simulating a 310-pound individual have shown to exert up to 3,000 pounds of force from a drop of only a couple of inches on a cable lanyard. “The real concerns are all those forces are going to be taken into your body,” Bohmbach said. The human body can only take up to 1,800 pounds of force before it becomes injured, he said. An energy absorber in a fall arrest system can negate that force, but only up to a limit. After that, if a person is heavier than the system’s capacity, all of those forces are going to go to the body and put the individual at risk of serious injury or death, Bohmbach cautioned. Even if an individual is within the capacity of the fall protection system, a worker whose fall has been arrested must depend on co-workers for aid, which can be complicated if the fall victim is obese. “It’s an extremely difficult rescue to make,” Bombach said – especially if overweight workers are unconscious and unable to assist in the rescue attempt. While hanging in the fall system that saved his or her life, the heavier worker is at greater risk of suspension trauma because he or she puts more pressure on the straps of the harness. This could lead to more bruising or blood pooling, which occurs more quickly than it would in a person of a more healthy weight, according to Harkins. Rescue gear also has capacity limits. Scenarios in which a rescuer and the victim may have to ascend or descend on the same lifeline are not an option if the combined weight exceeds the safety limit of the lifeline. Individual companies and organizations would need to base their rescue plans on the health of the worker to find the best solution in various circumstances, Harkins said. Weight considerations extend beyond fall protection. “You have to look at everything,” said Lynn Beiswanger, TSM safety coordinator for Bismarck, ND-based Basin Electric Power Cooperative. Ladders, aerial lifts and bucket trucks all have weight capacities, and a piece of equipment rated for three people may have a weight limit far lower than that of your three workers. Check the weight rating, keeping in mind the weight of your workers and their equipment as well as how much of that weight you expect to be placed on a piece of equipment, Beiswanger said. Heavier workers present more issues than finding the right-sized PPE. Such workers are going to have “more accidents, more absenteeism and higher health insurance,” said Jerome Congleton, a professor at Texas A&M’s School of Rural Public Health. Several recent studies support that claim. In 2007, researchers from the Johns Hopkins Bloomberg School of Public Health in Baltimore published a study in the American Journal of Epidemiology (Vol. 166, No. 2) that showed having a body mass index in the “overweight” or “obese” range was associated with an increased risk of traumatic workplace injury. The study’s three-year observation of 7,690 hourly workers at various aluminum manufacturing plants across the country found that of the 29 percent of workers who were injured at least once, 85 percent were classified as overweight or obese. Additionally, the Australian government released a paper in August 2008 outlining the various implications obesity has on workplace health, safety and workers’ compensation. The paper noted that obese workers were more likely to take sick leave and be less productive, take longer to recover from an injury, have more complications to injury treatments because of their weight, and had medical expenses more than five times that of a normal-weight individual. “If I’m going to employ 100 people, I want 100 people most likely not to need my health insurance money,” Benden said. However, he conceded that this could potentially set up situations in which overweight people file lawsuits alleging they did not get hired because of their weight. As reported in Safety+Health in February (“Get healthy or get out?” p. 50), some companies are offering incentives for workers to lose weight, while others are penalizing unhealthy and overweight workers by imposing an insurance surcharge. More companies are likely to make use of both strategies in the near future, Benden said. However, when an overweight individual becomes injured on the job while operating a piece of equipment that the worker’s size made difficult to do safely, whose fault will it be? Will the company have a responsibility to move an overweight individual to another job? This raises various kinds of labor issues, Beiswanger warned. Sending a heavier or larger worker to perform a task in a certain area, such as working from a height, can bring forth inherent problems. An overweight worker is more likely to become fatigued or suffer from a heart attack, thus becoming more prone to a fall. “If we have a choice, I think most people would agree ... who would you rather put up in the air – a lighter worker with fewer complications or the heavier worker with the potential for more complications?” Harkins asked. Additionally, the health problems that stem from being obese can endanger a worker’s employment. Gordy Neumiller is a substation electrician in Beulah, ND, for Basin Electric Power Cooperative. In March of last year, he weighed 234 pounds. 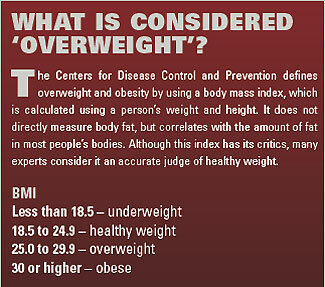 Standing at 5’6”, a CDC BMI calculator put Neumiller at 37.8 – obese. He had several health problems (including type 2 diabetes, high blood pressure and high cholesterol) and was taking six different types of medication. “I was always tired when I got home at night because of the overweight,” Neumiller said. Along with his health, his job was also at risk. He grew closer and closer to needing to take insulin to control his diabetes – something that would have disqualified him from maintaining his job-required commercial driver’s license. To save his job, Neumiller underwent weight-loss surgery and during the past several months has shed 76 pounds, coming within 4 pounds of his 154-pound goal weight. As a result, Neumiller is off all but one of his medications, enjoys his job more, and is not as fatigued, making him feel like a safer worker. That source is the individual worker’s weight. No amount of triple XL work shirts or PPE with an increased weight capacity can solve the core problems with an individual’s weight. Even if a worker has a perfect safety record at work, the other health effects of being overweight or obese can lead to a higher risk of becoming ill or getting injured off the job, which is where most unintentional injuries occur. To fight the trend, Benden said safety and health professionals and employers will need to become more proactive. They should encourage their workers to change their unhealthy behavior by offering nutritious options in the cafeteria, providing an onsite exercise facility, and involving communities and employees’ families. Congleton said obesity has become so prevalent because Americans have adopted a more sedentary lifestyle. Calorie intake has remained the same or grown, but people are not burning as much energy. Simple steps that lead to more calorie burn include taking the stairs instead of an elevator or parking farther away from the door. Changing employees’ workstations to encourage more standing also can help, Congleton said. By standing an additional two hours a day, a worker can burn 280 calories more per day and lose 20 pounds in a year.